Review Summary: GULAAL is interesting in parts. The film may appeal to those looking for a change from the run-of-the-mill fares week after week. GULAAL is interesting in parts. The film may appeal to those looking for a change from the run-of-the-mill fares week after week. Anurag Kashyap leaves behind the 'emotional atyachar' of 'Dev D' for an equally violent and chaotic world of student politics in 'Gulaal'. Too much Democracy can go to your head. In a film about grassroots politics situated in the Rajasthan to Bihar periphery, the film must have all/some of the following: A central god-like leader (in Omkara it was Omkara; here it’s Dukey Bana). Accuse him of thinking abstract, but you cannot accuse Anurag Kashyap of following the stereotype. The start is tremendous. 'Aarambh hai prachand,' intone Piyush Mishra and Rahul Ram as the warrior readies for battle in Aarambh, the opening track of the album. 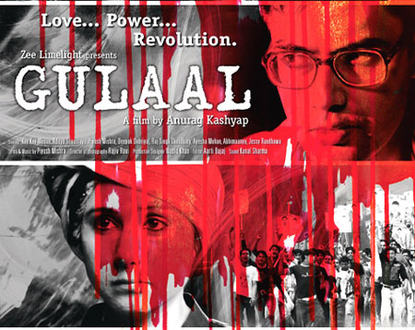 Gulaal is a must watch. It doesn't hold universal appeal nor is it a typical Bollywood entertainer. The film is different engrossing and pure quality. Hats off to the director - Anurag Kashyap - the face of changing cinema. But one is ready to forgive, faced by the brilliance of much of this film. Gulaal has been a long time in the making — seven difficult years — but the delay has, if anything, added depth to this tale, told with great passion, craft and daring by Kashyap.